#3016 at North Freedom, August 18, 2001. 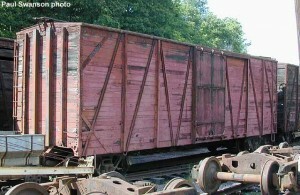 #3016 and sister boxcars were built by the Mather Car Company in 1941, just prior to WWII, for lease to Ohio’s Akron Canton & Youngstown Railroad. Many smaller roads such as AC&Y found leasing cars financially and operationally advantageous. In 1955, AC&Y no longer had need of the Mather-built cars, and they reverted back to the lessor. By this time, Mather had merged into North American Car Corporation of Chicago. The cars retained their AC&Y numbers, but were relettered with MCAX reporting marks. In 1970, North American donated #3016 to Mid-Continent. The car was shipped to North Freedom with four sister cars. Mid-Continent’s AC&Y “fleet” has been used in museum freight trains sporadically over the years, but currently serve for storage of materials and equipment. There is only one other AC&Y Mather boxcar known to exist today outside of Mid-Continent’s collection. It is owned by San Diego Railroad Museum at Campo, California.